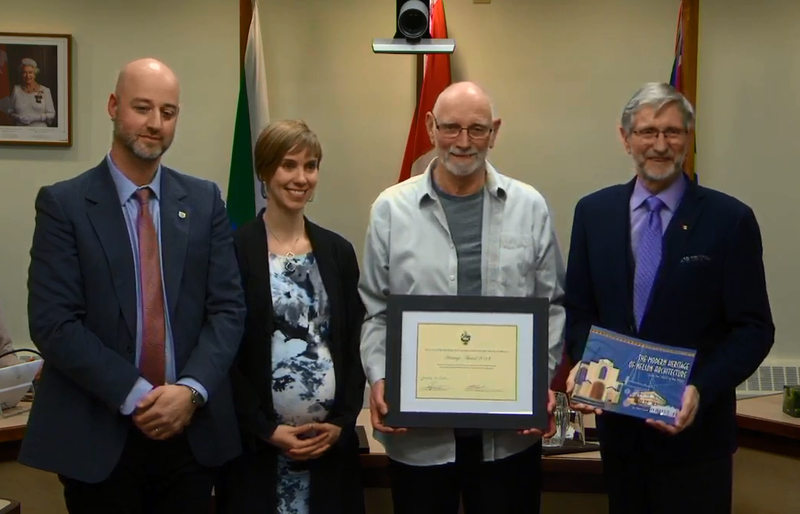 Peter Bartl (second from right) receives the City of Nelson heritage award from councillor Jesse Woodward, Touchstones Nelson executive director Astrid Heyerdahl, and mayor John Dooley. 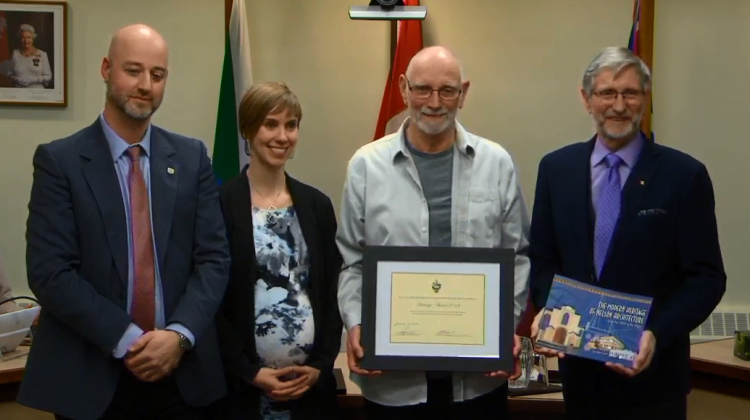 Local historian Peter Bartl has been awarded the City of Nelson’s annual Heritage Award for 2018 for his dedicated work in the education, promotion and preservation of Nelson’s local history. The award comes with a $1,000 honorarium. Bartl spent over two years researching, knocking on doors and delving into the Shawn Lamb Archives at Touchstones to identify and document a unique aspect of Nelson’s architectural heritage. The result is his comprehensive and beautifully designed book, The Modern Heritage of Nelson Architecture from the 1920s to the 1960s, which offers extensive photographic and textual information on over seventy of Nelson’s Art Deco, Mission Revival and Modernist buildings, both commercial and residential. Among the buildings featured are the Capitol Theatre, the Terrace apartments, the Medical Arts building, the Civic Centre, the Chrysler dealership, and the old Scandinavian Church. Bartl organized and guest-curated (with Jane Merks) the exhibition Art Deco in Modern Times at Touchstones in 2017/18, donating his time and knowledge to the community by providing educational presentations and walking tours based on his research. Through this, he broadened the community’s knowledge and challenged all to look to see and seek the architectural beauty we walk by every day. The city’s heritage working group established this award in 2015 to recognize individuals, groups, businesses, or other organizations that have made an outstanding contribution towards the preservation and/or promotion of Nelson’s heritage, and to reward and encourage initiatives in support of it. Last year’s winner was Greg Scott. Previous winners were the Nelson and District Chamber of Commerce and local retailer Cartolina. This year saw a record number of nominees.